Cyclists have long known about the importance of rolling resistance in selecting tyres for racing, group rides or even general training. A tyre with a high rolling resistance will require more power to travel at the same speed, whilst a low rolling resistance tyre requires less power. 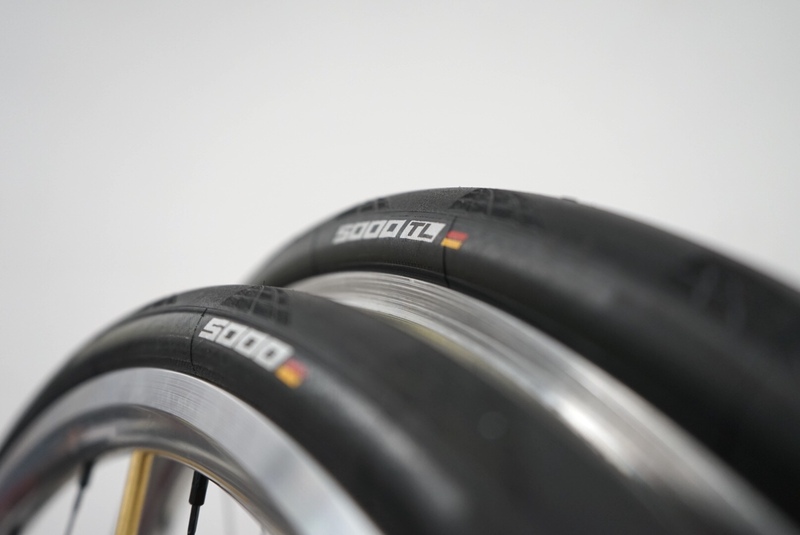 Continental have released two versions of the GP 5000, a clincher compatible tyre in sizes 23mm-32mm, and a tubeless compatible tyre in 25-32mm. The goal of this test was to evaluate the rolling resistance performance of the tubeless version of the GP 5000 in comparison with the clincher version. Having previously tested a 23mm clincher version of the GP 5000, and finding it to be faster than a GP 4000 23mm but slightly slower than a GP TT 23mm, we had to increase the clincher size for this test, as the tubeless version of the GP 5000 (GP 5000TL) only comes in 25mm at a minimum. The tyre casings are noticeably different before being installed, with the GP 5000 TL having a thicker casing and bead for better tubeless compatibility. All the tyres were mounted on a shallow section aluminium rim, with an external rim width of 24.7mm and an internal rim width of 19.6mm, and inflated to 90psi. Generally speaking wider tyres have lower rolling resistance - for this test we evaluated the performance of a GP 5000 in two widths (23mm and 25mm), before then testing the GP 5000 TL in 25mm. In order to test rolling resistance, we used the same tyres and swapped between them as a rider rode a bike on rollers, measuring power output and speed, as well as atmospheric conditions and bike/rider weight. This allows us to calculate what is known as the Coefficient of Rolling Resistance (or "Crr"), which can be used to model the power output required to travel on a normal road. A lower Crr is better - in that it requires less power to travel at the same speed. 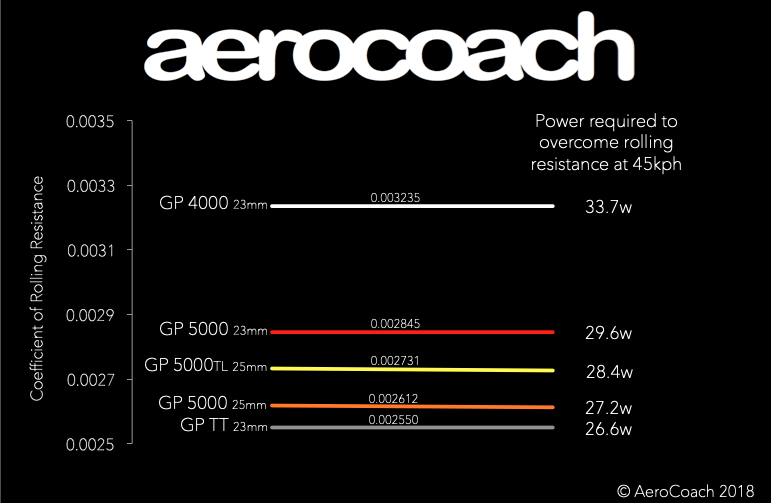 The GP 5000 clincher in 25mm was faster than the tubeless GP 5000 TL 25mm, saving 1.2w at 45kph for a pair of wheels. In this test we found that the wider versions of the GP 5000 were faster, but that the clincher GP 5000 25mm was marginally faster than the tubeless GP 5000 TL 25mm. This small penalty in rolling resistance may well be outweighed on the road by improved puncture resistance, as tubeless tyres will seal themselves against small punctures automatically. The GP 5000 TL in 25mm is a very good performer for rolling resistance overall, and would make an excellent training and/or race tyre.